Remember this photoshop mock up for one of my eDecorating clients? It’s a little hard to get a sense of the true colors in these iPhone pics, but the Osborne and Little paper is in and it’s gorgeous! And check out those fab pillows from one of my favorite LGN sponsors, Plum Cushions! 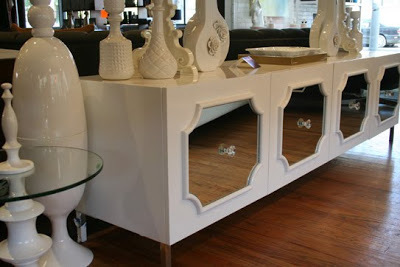 The big splurge of the project was this amazing white lacquered and mirrored credenza from Room Service Home. They give discounts to designers, so we were able to get a pretty good deal on the piece. Isn’t it a showstopper? 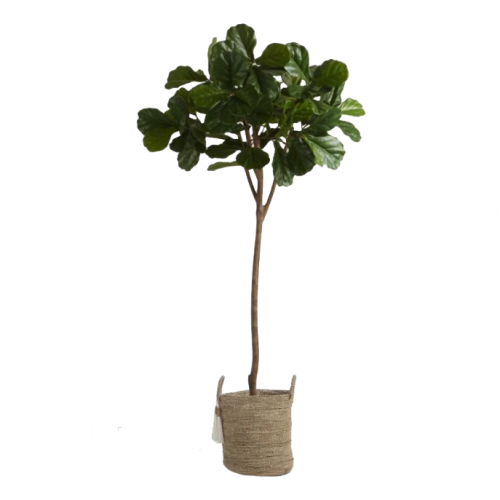 Check out some of my other favorite offerings from RSH. If you have the money, the way to go is to mix a piece or two like one of these with other mostly traditional (and hopefully less expensive!) furnishings. I am so crazy over these pink kids chairs. Perfection with a farmhouse style children’s table. Oh, little red desk. How I love thee. 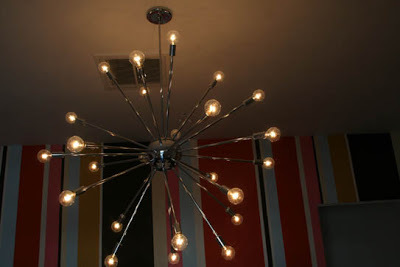 $550 is not a bad price for a sputnik as big and awesome as this one. Ah, yes. 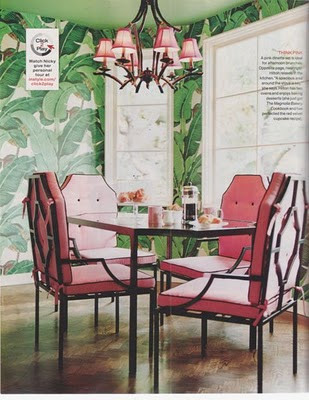 Nicky Hilton’s dining room! Did you know that Room Service Home has quite the celebrity client list? I know I’ve posted this before, but my favorite trick for kid-friendly dining chair upholstery is using faux animal skin. 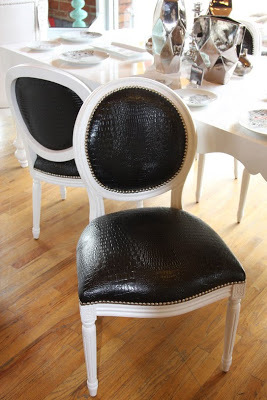 I LOVE the black faux croc on these louis dining chairs. I so wish I could find this exact table somewhere. Does anyone remember the source? 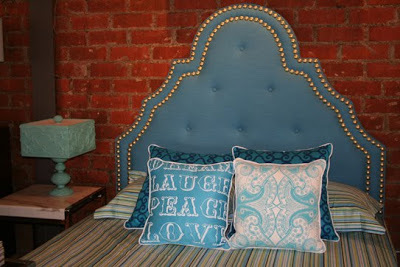 This turquoise headboard is totally on my DIY list. I think it would be pretty simple to replicate. I just need a good source for oversized brass nail head trim. Love it. 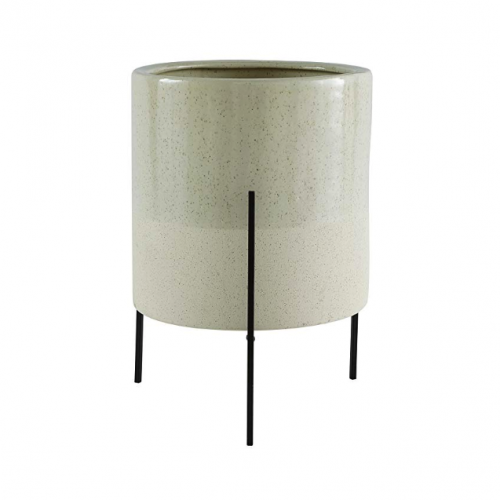 Nothing beats a sleek chrome and lacquer side table. I’d love to pair something like this with a tufted linen sofa. Wouldn’t navy blue be stunning? Deee-lish – all of it! I was recently in a home designed by Betty Burgess (with Betty's design assistant), and the assistant told me that the clients agreed to use a chandelier that Betty has been trying to convince a client to use for years – not the sputnik, but similar shape and quite spiky. It reminded me of a sea urchin. Sometimes you need that client who is willing to go out on a limb a bit! I love those pieces. Gorgeous! I'm drooling, Jenny. So beautiful! 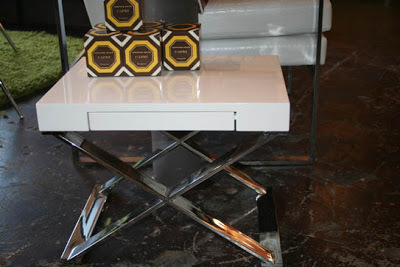 And yes, that mirrored console IS showstopping! 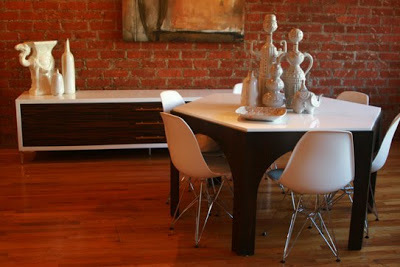 Liking the sputnik chandy & the two chrome tables with a tuftted settee would be sinfully juxtaposed!! Like it! I want that credenza too! :) It turned out really great. Love the yellow table lamps from Room Service! Hope you're enjoying your little new one! I love that shop- it's chock full of amazing items! Lovely room! The table is by T.H. Robsjohn-Gibbings. It's in the Domino Book of Decorating. I LOVE the wallpaper (I tried to convince my husband to hang it in our entry) – but I don't quite love the sisal colored wall as much (atleast I assume that is the color, since it seems to match the rug). Hope that you can get a regular photo to post as well, as I am sure that it all makes sense when you can see the details. What are the two bookshelves in the back? btw love the accent chair choices for the room. Love the headboard. I want to do something just like that for my girls' rooms! 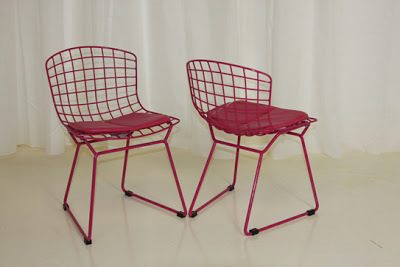 Also love the bertoia chairs! I love that headboard! 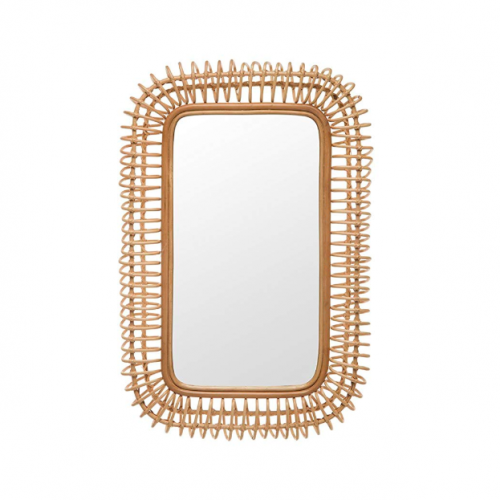 There have been several projects on your blog that have me itching to do something with some nail head trim! The room looks amazing! great work Jenny. love the shop too, what fun. Hmm…is it okay I want it all!? That mirrored credenza!? Totally to die for! oh that room is fabulous! 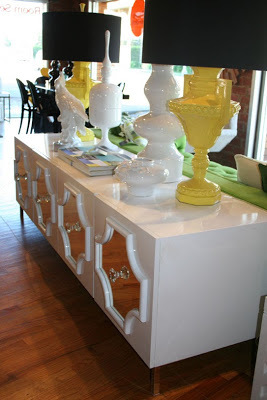 seriously, that mirrored credenza is calling my name. 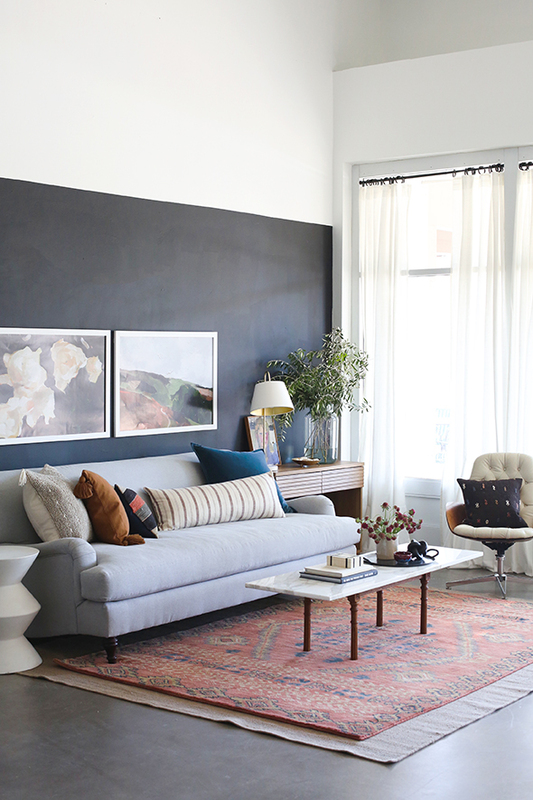 and where oh where is that orange ottoman/coffee table from? I wonder, what is the difference between a credenza and a console? We are in the market for a nice flat-screen TV console such as you might find at Ikea or Pier One, but alas our budget is more in the thrifty range and you certainly don't find flat screen TV consoles being given away around here. Ho-hum. Beautiful job- love the wallpaper! all these looks = very chic! How have I never heard of Room Service Home before?! Thank you! Katherine – Have you tried Craigslist? I'm currently looking for something for my living room, and there are so many great options, especially if you're just looking for a tv console. I typically use credenza, buffet, console and cabinet as search terms, but that's because I need a cross between a TV console and a buffet. Wow that looks sooooo great!!! I love the wallpaper in your client's LR and the credenza is a wow! Katherine and Brigitte, I was in the market for something like that, (using Craigslist), and I found the best ones using, "dresser" as the search term. You know those old, wide ones? You have to sift through a lot of "not-what-I'm-looking-for's," but some people call it a dresser, even if there is just one drawer. 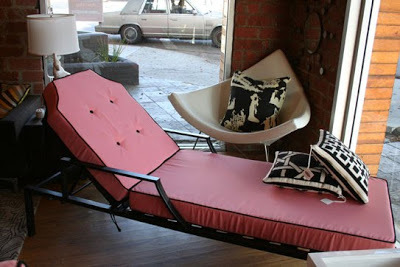 I a swooning too – gorgeous furniture. oh goodness..i love it ALL! 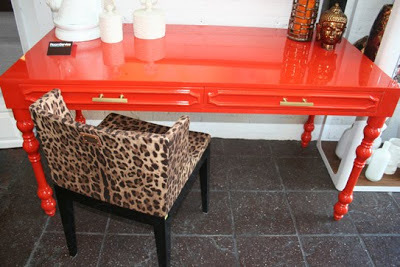 especially the red desk….sort of reminds me of the side table in your home office. LOVE IT! love the brass headboard too. thanks for all the kiddo ideas, we have number two coming soon and need to get our space ready. Oh, I'm dying over that little x-base stool. I bet that you could transform something thrifted into something similar to the console, too– not in my budget at any price right now, I'm afraid. Your room turned out just beautifully! I came upon you through Cote de Texas and spent all of yesterday combing through your fabulous posts. I'm smitten by you and your blog! I think you are amazingly talented and am so inspired by you! Congratulations on your new baby daughter. You really must be Super Mom! All of it is happy and swellegant! could you let us know where you got the rug? 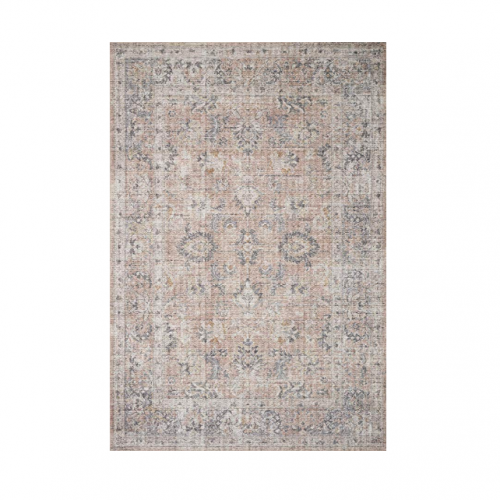 i too have been looking for a natural fiber rug- one that would be good for a high traffic room but would be comfy enough for a crawling toddler… oh, and one that won't break the bank either! any recommendations? I love it, all of it! I've been all about credenzas and consoles with the twin lamps, these yellow ones with the whole scheme are particularly fabulous! I love the mirrored credenza as well as that mandarine orange Hollywood desk! I want it too! 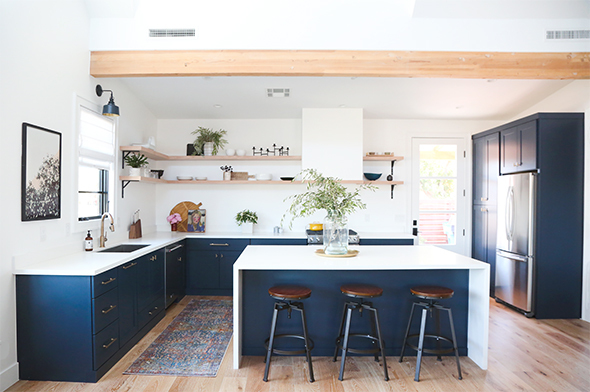 Where do I find those blue cushions? Especially the Dream Peace Love one???? 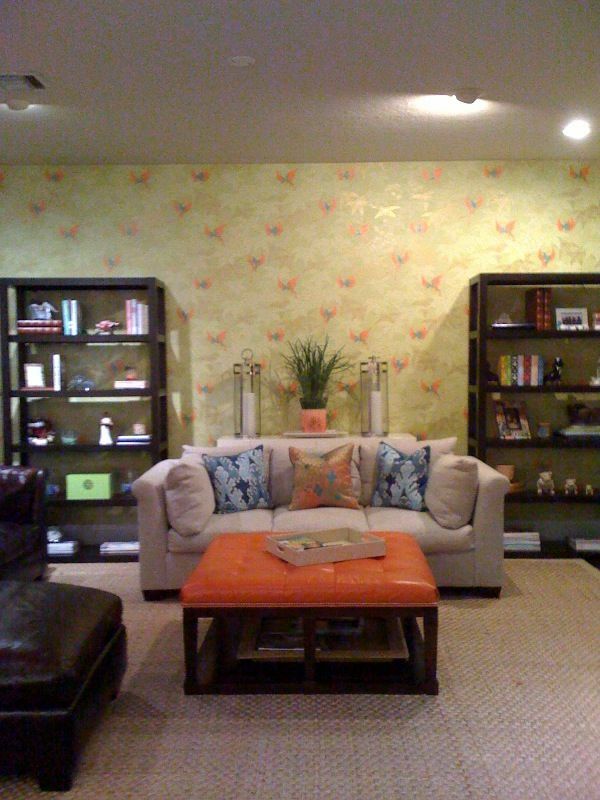 Nicole – My client assures me that the wall color is better in person. The iphone pics have washed out the walls a little and the brown in more green in real life. Anon – The bookshelves are from West Elm. Love them! Becky – Thank you so much for the lead on the large nail head trim! Can't wait to check it out! Molly – the orange ottoman is from WS Home. 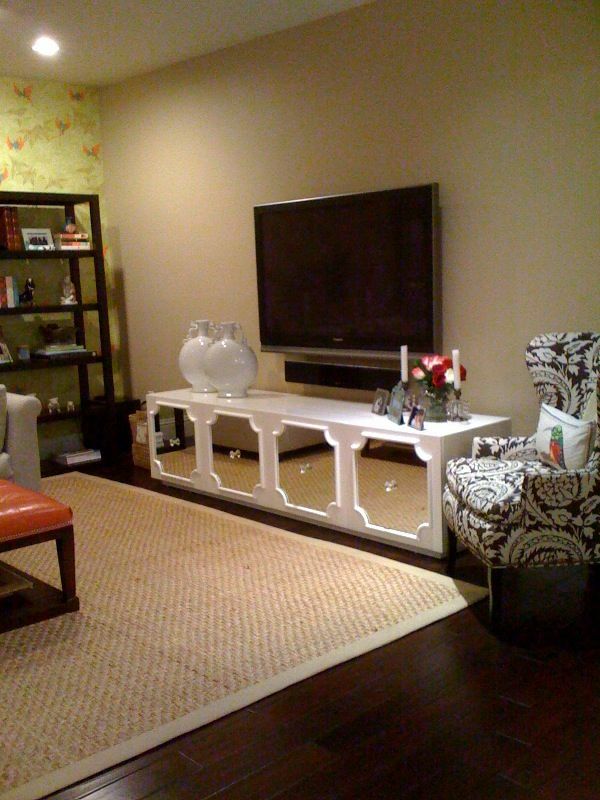 Katherine – credenzas, sideboards, buffets, consoles and even dressers are all used interchangably. There are differences in reality, but people on Craigslist use all those names usually and it's a good idea to search for all of them. Good luck! This is my first official comment to your INSPIRING blog I read daily. For nail heads, try this site http://www.dkei.net/cgi-bin/imageFolio.cgi?direct=80_Nailheads_Upholstery_Tacks. I love the variety of nail heads, and trade discounts are available. While I am here I will say THANK YOU for the daily dose of inspiration. Good luck with your move to NYC. i have those bertoia kid chairs from room service, in white and LOVE THEM! I just came across these pictures, where they use the same wallpaper in a home renovation in Germany!! Water clocks did not depend on the observation of the sky or the thomas sabo sun. The earliest water clock was discovered in the tomb of Amenhotep I who was buried around thomas sabo online shop deutschland 1500 B.C. Greeks called them clepsydras ; they were stone boxes with sloped sides that allowed water to drip thomas sabo anhänger at an almost unceasing rate from a small hole in the bottom.Other clepsydras were cylinders or thomas sabo charm club anhänger bowl formed engineered to slowly fill up with water coming in at a near sustained pace. Markings on the thomas sabo anhänger günstigangebote thomas sabo anhänger at night, it is thought they were utilized in the day hours too. A metal bowl with a hole the bottom was placed in a bigger bowl crammed thomas sabo charm with water.It would fill and then sink in a certain quantity of time.Since water flow was not exactly predictable sabo charms and difficult to control the flow accurately, timepieces that depended on water were very inadequate. People sabo charm were drawn to develop more accurate ways of measuring and telling time.The development of quartz crystal clocks and timepiecesthomas sabo anhänger sale depended on the crystal size, shape, and temperature to create a frequency.